We all are very familiar with the publisher " Mc Graw Hill Education " with their very successful books like Indian Polity by M Laxmikanth, Indian economy by Ramesh singh and many more books for competitive exams. Now they have come with a new book that too especially for TNPSC Exams - 'Manual for TNPSC Examinations - General Studies'. The syllabus for Group 1 and Group 2 exams is in Degree standard. It means a through knowledge about the topics are required to answer all the questions. So this book could be a better supplement to your study materials. 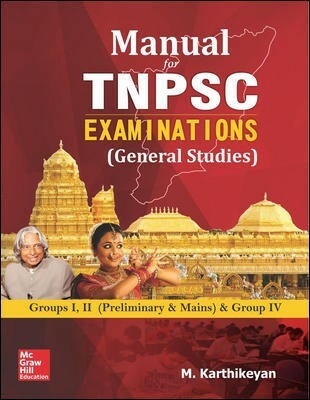 In this book nearly 70 to 80% of the TNPSC general studies was covered. The Section A covers all the general stuffs like Indian history, Geography, Economics, Polity, Science, current affairs, aptitude and many other miscellaneous topics. Though the book is heavy in its look, all the subtopics are crispy and short. The aptitude section has many model questions to solve. For Aptitude section you need to buy some other standard book as this book lack many short cut techniques when compared with the other standard books. Section B focuses mainly on Tamil nadu, It covers Tamil nadu history, Geography and more. The south India history Section of the Group 1 and Group 2 section is covered in this section B. Those who are preparing for Group 4 and VAO alone need not buy this book because most of the questions could be answered just with the knowledge of the samacheerkalvi Text books. Overall we can give 7 marks out of 10 for this book.